1.2 The I.A.C.A Championship Rules will apply except where modified by IACA under experimental Championship rules. In accordance with ISAF Regulation 20 (Advertising Code), boats may be required to display the advertising chosen and supplied by the organizing authority. c) The measurement form or certificate of the boat. e) A supporting document to justify their membership to an ISAF Member national authority. g) A proof to be insured with a valid third-party liability insurance with a minimum cover of 1.000.000 Euros. h) For foreign sailors the organization will provide an insurance company on spot, if needed. Entries: no maximum number of entries, it is an open Championship. In case of more than 120 entries, fleet splitting will apply in accordance with the IACA Championship Rules Appendix 2 and the Notice of Race will change accordingly. Registration and payment should perform according to IACA rules (see art. 4-point c) of the IACA Championship Rules). Competitors can register through their National Association. As of June 30th each National A-CAT Associations should transfer their entry fees to the Organizing Committee. Bank + address: Centro Velico Punta Ala asd; IBAN: IT49B0503472241000000184818- BIC: BAPP IT 21 T 28. A total number of 9 races are scheduled. A maximum number of three races may be sailed per racing day, but only in compliance with I.A.C.A. Championship Rules. When the reserve day will be used the procedures will be detailed in the sailing instructions. If at least 5 races have been completed, no warning signal will be made after 16.00 on the last day of the regatta. Each boat shall produce a valid measurement certificate at registration. Measurement and equipment inspection will be conducted in accordance with A Class Catamaran Measurement Guidelines. The Equipment Inspection Regulations for the Championship will be published on the Championship website no later than 1st June 2015. Preliminary Sailing Instructions may be posted on the Championship website. The sailing instructions and their appendices will be available during confirmation of registration (see§6) after June 1st . 11.1 5 races must be completed to constitute a World Championship series. 11.2 If fewer than 6 races have been completed, a boat’s series score will be the total of its race scores. Coaches, team leaders and representatives from participating nations shall register at the Regatta Office before the first racing day. They must display the Organizing Committee Flag and boat number upon a deposit of 50 Euros. No equipment capable of radio transmissions or radio communications may be carried by any competitor while on the water (except if provided by the organizing authority). This restriction also applies to mobile telephones. Trophies or prizes should be awarded to the Top 10 classified of the event. Trophies or prizes should also be awarded to the top placed junior (aged less than 25), master (aged 45-50), grand master (aged 51-55) and great grand master (aged 56 plus). Trophies or prizes should be awarded to the top placed female sailor. 15.1 The Centro Velico Punta Ala asd in association with the Italian A-Class Association and their officers, members and volunteers do not accept liability for loss of life or property, or personal injury or damage caused by or arising out of the regatta and competitors take part in the regatta at their own risk. 15.2 The establishment of the Notice of Race and the sailing Instruction in no way limits or reduces the complete and unlimited responsibilities of a competitor being solely and entirely responsible for the management of a boat he is sailing. 15.3 A competitor shall maintain their boat in a safe and seaworthy condition. 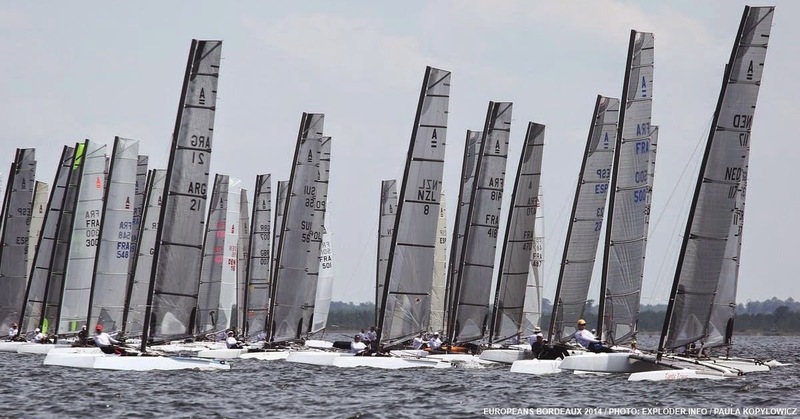 15.4 A competitor shall be of good health and a competent sailor capable of racing a A-class in open water in strong winds and it his sole responsibility to decide to participate in a race or to continue racing. 15.5 A competitor is recommended to have personal accident and health insurance that covers them while attending the regatta and whilst racing. By entering the Championship competitors accept that they may be photographed and/or videotaped participating in the race and/or using the regatta facilities and they consent to the taking of such images and to the use, re-use, publication and republication of such images in any media, in conjunction with the competitor’s name or not, without compensation and without the competitor’s approval of such images or any use thereof. The event will take place at the Centro Velico Punta Ala, c/o PuntAla Camping Resort (www.campingpuntala.it ). For further information on the venue and the racing area, see the event website hosted by the Italian A-CAT Association website. Spaces for Tents/Campers/Caravans and Accommodations can be found at the hosting event location: www.campingpuntala.it, e-mail: booking@campingpuntala.it ph. +39 0564922294.